Hi, I am interested in your 1972 Lincoln Continental (stock #4919-CHA) listed on Autotrader for $10,995. I'd like to get more information about this vehicle and confirm its availability. 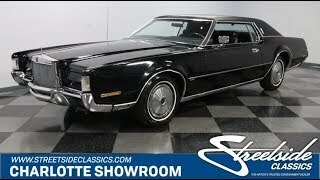 A low-mileage and loaded triple-black survivor is what you get with this 1972 Lincoln Continental Mark IV. And as you dig deeper you discover everything from desirable big block power to some sought-after rarity. So its amazing all this classic car distinction is currently being offered for such an obtainable price. This is the first year for the Continental Mark IV, and its for lovers of intricate design. The front has the Rolls-Royce style grille and 1970s chic flat front hidden headlights. Out back, the deck lid features the Continentals trademark spare tire hump/continental kit. And because it was built before new bumper laws, they fit flush with the body as an integral part of the design. It was all part of Lincolns upper class image, so its essential that its all as crisp as you see on this example. The paint has a great shine that you love from a deep black, and as you get closer there are also plenty of signs that this is the original application from the Michigan factory. So you get the best of both worlds a nice luster for casual observers, but the unmissable worn-in look for those who want to see a 45+ year survivor. The coordinating black vinyl roof is not only a terrific premium piece thats still in great condition, but also Lincoln fan will notice something else. In 72 the opera rear windows were an option. They were so popular that they became standard in the subsequent years. So to find one from the single-year where the full roof was available, but rarely chosen, is true distinction this survivor will carry forever. The full black interior finishes off the ultra-desirable triple black package (exterior, roof, and interior) this had from the factory. The pillow-top seats have that feeling of true cruising opulence. You have the choice to seat six total, or fold down the front armrest to give you true individual luxury. Plus, the wood-like trim on the doors and dash add to the upper-class feeling while breaking up the darkness. As expected from a vehicle of this caliber, there are plenty of factory luxuries, including power windows, power locks, cruise control, and provisions for power seats. This is such a great survivor that even the stereo is still the correct factory 8-track unit. You can really enjoy this classic car experience with all the windows down and still stay in comfort thanks to the cold-blowing factory air conditioning. As you slip behind the wood and black steering wheel, you get the tingle to take this one out for a cruise. So while the coupe has only averaged around 1,200 miles annually over its lifetime, we know you wont be able to resist adding to that total. Fords smooth and refined 460 cubic inch V8 with four-barrel carburetor is a terrific powerhouse, and this example is believed to be original to the car. Serious big block power from just before the low-compression era creates the kind of power and torque that made these grand cruisers feel effortless. Fans of originality will love how the big blue Ford engine looks as survivor-grade as the exterior. Youll enjoy features like the power steering, front disc brakes, and a three-speed automatic transmission. Its part of a total package that can easily take you in comfort to car shows as far away as you want. The sale comes with the right paperwork, including the original warranty card, owners manual, and maintenance records. This is the survivor-grade triple-black big block cruiser of your dreams. So at a price like this, you know you need to hurry. Call now!